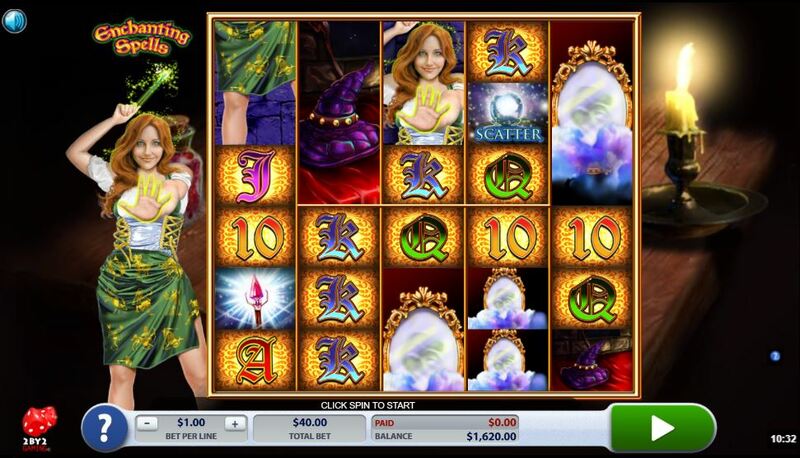 Enchanting Spells slot is one of those games that has an unusual reel set to make it more interesting, like Lightning Box's Druidess Gold or WMS's Red Flag Fleet. Here we have a magical and mysterious world on our reels which lie over a table in a dark room lit by a solitary candle along with gentle music to set the mood for the theme. If you have ever played Netent's Magic Portals and IGT's Magic Castle, well think of those two games combined and you won't be far off the mark for this 2 By 2 creation. Will these Enchanting Spells work to expand our cash rather than shrink it though? I did mention the odd reel format so now let's see why - you have what appears to be 5 reels of 6 rows, but in fact only the two outside reels are 6 rows, the middle three are actually two 3x3 slots sitting above each other! So the outside reels are actually named as reel 1 and reel 8, the 6 smaller 3-row reels in the centre are 1 to 6. The two larger reels can have stacks up to 6 rows high but only of the Wizard Wild and Princess, and the 6 smaller ones 3 rows high but with no Wizard Wilds possible. You pay a minimum of 40 coins for the 60 available pay lines. So the Wizard Wild appears stacked on reels 1 and 8 and should he appear fully stacked on either or both then all the Book icons on the remainder of the grid turn Wild. The Princess pays best at 12.5x for a 5-of-a-kind win, then the Book at 7.5x, the Wand or Blue Potion at 3x with the Hat or Mirror at 2x for a full line. Card values pay either 40 or 75 coins but unlike the picture icons cannot appear stacked 3 rows high, but only 2. You can get scatters on all 8 reels which will trigger 8 free games for 3 in view up to 30 for all 8 plus a nice 75x bet prize. Random Multiplier Free Spins - all wins will be allocated either a 2, 3 or 4x multiplier and these may be retriggered. Guaranteed Wizard Free Spins - reel 8 is frozen with the fully-stacked Wild Wizard for every spin and as in the base game this means any Book icons will become Wild. Wizard On All Reels - no Books appear on the reels now but the Stacked Wizard can now be seen on all 8 reels. You can retrigger the spins too.